On Tuesday March 28th Dryden School District residents will have an opportunity to vote on two capital project propositions. The main project was developed over a two year period with input from over 50 individuals including Board Members, District Administrators and Staff members, and community members as well as the districts architect/engineer, construction manager and financial advisors. Much like one’s home ages and needs upkeep and repairs, so too, do our schools. The project consists of prioritized needs identified by the State Education Department’s Building Condition Survey that is required every 5 years. The school website has links to several resources on its home page to help you research your decision. http://www.dryden.k12.ny.us/ follow the Capital Project 2017 link on the right side of the page. 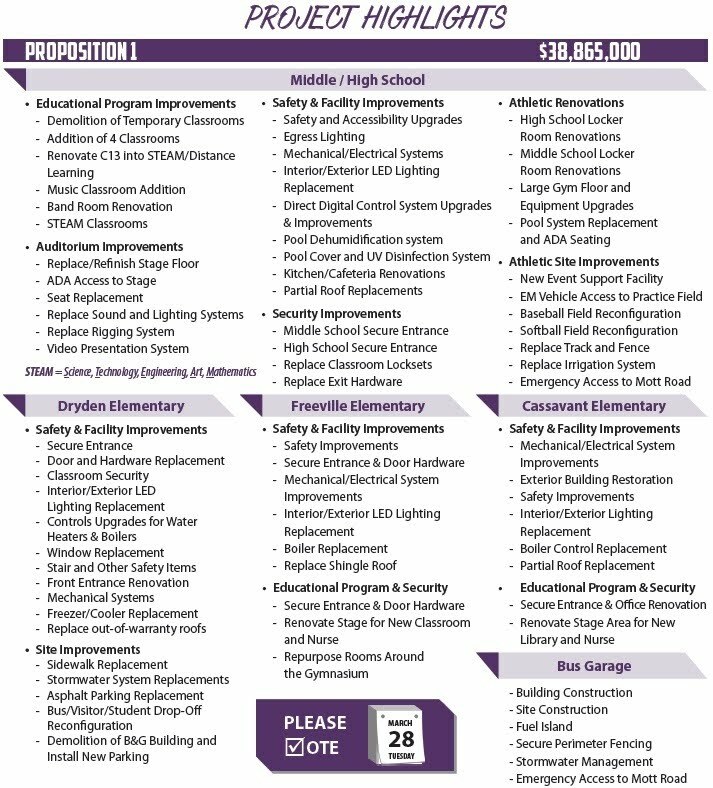 Proposition 1 provides major improvements and renovations at all 4 school locations as well as a new bus garage, all for a very small taxpayer investment. (See Proposition 1 highlights in the photo below) For only $.02 per assessed value of $1000 (yes, that’s 2 cents) or $2.00 per $100,000 of assessed value, the Dryden Central School District gets much needed Educational Program Improvements, Auditorium Improvements, Safety and Facilities Improvements, Security Improvements as well as Athletic/Physical Education renovation and site Improvements. All for $2 per $100,000 of assessed value. These numbers are all based on Basic STAR - Senior STAR would decrease those totals by one-half. The investments in the buildings, infrastructure and schools not only benefit the families with students in the district. The schools are a “hub” of community activity throughout the year. Being used evenings, weekends and over breaks by various groups. Strong school districts with facilities a community can be proud of, can increase property values. A vote of YES on Proposition 1 means Dryden tentatively starts the process of building for its future as early as April with design and planning. Construction could start as early as the spring of 2018 with a December 2020 completion date. And Field vs Turf maintenance comparison done by Emily Shipe. The district could save an estimated $8394 per year with Turf. These are median yearly tax bill increases if Proposition 2 passes. Total includes Prop 1 since it has to pass for Prop 2 to be considered) Again, these are based on Basic STAR and Senior STAR would be one half these amounts.